Memo challenges claims by DHS chief that separating families was never policy. Democratic Sen. Jeff Merkley on Friday asked the FBI to open a perjury investigation into Homeland Security Secretary Kirstjen Nielsen following the leak of a 2017 internal draft document that explored separating families as a way to curb illegal immigration at the border. The memo challenges the assertion by Nielsen last June on Twitter and in media briefings saying "we do not have a policy of separating families at the border. Period." The Dec. 16, 2017, document, provided by Merkley's office, which said it received it from a whistleblower, appears to be an internal memo on legal options to address families who were arriving at the border. Among the options listed: the "prosecution of family units" and "separate family units." What would happen to their children? The memo said they would become “unaccompanied minors,” or UACs. “This will require close coordination with (Health and Human Services), to ensure that sufficient capacity is available to detain the UACs," the document stated. Merkley points to Nielsen's public comments that U.S. policy never called for separating families. He notes that Nielsen at one point told the House Judiciary Committee: "I'm not a liar. We've never had a policy of family separation." "Compelling new evidence has emerged revealing that high-level Department of Homeland Security officials were secretly and actively developing a new policy and legal framework for separating families as far back as December 2017," Merkley, from Oregon, wrote in a letter to FBI Director Christopher Wray. In a statement on Friday, DHS spokeswoman Katie Waldman said, "As Secretary Nielsen has said publicly and testified multiple times, DHS has never had a blanket policy of separating families in custody. What this pre-decisional, pre-deliberative memo — as well as previously leaked pre-decisional, pre-deliberative documents — shows is that the secretary was provided a menu of options to prevent the humanitarian crisis we predicted at that time and which has manifested itself today. Secretary Nielsen specifically rejected a policy proposal to separate all family units in DHS custody." Shortly after the December 2017 memo was drafted, in April 2018, the Trump administration announced a "zero-tolerance" policy at the border that resulted in the separation of some 2,700 kids from their families in a matter of weeks. 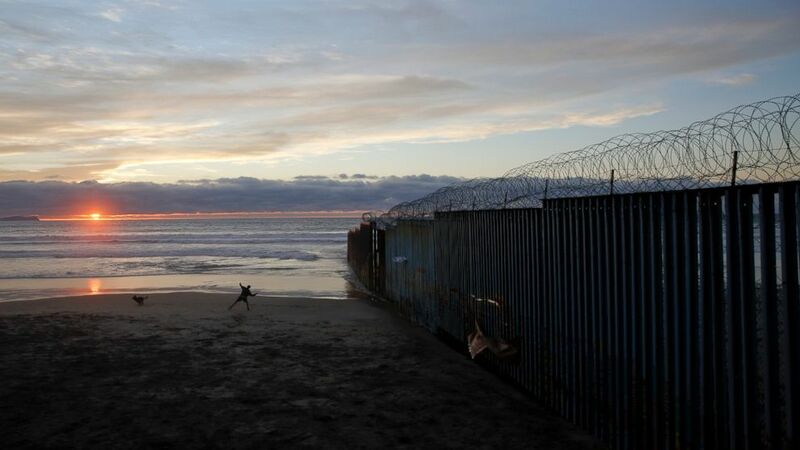 (AP) In this Jan. 9, 2019, file photo, a man throws a ball for his dog next to the border wall topped with razor wire in Tijuana, Mexico. Waldman said the administration was responding to an uptick of border arrests, which it blamed on a lack of a border wall and a court settlement that prohibits detention of children for longer than 20 days. Officials have said previously they believe that court settlement, known as the Flores Agreement, encouraged people to travel with minors. "In part we were predicting -- and trying to prevent -- the exact humanitarian and security crisis we are confronted by now," Waldman said. "It would be malpractice to not seriously examine every single avenue to gain operational control of the border and ensure that those who are entering our country have a legal right to be here." 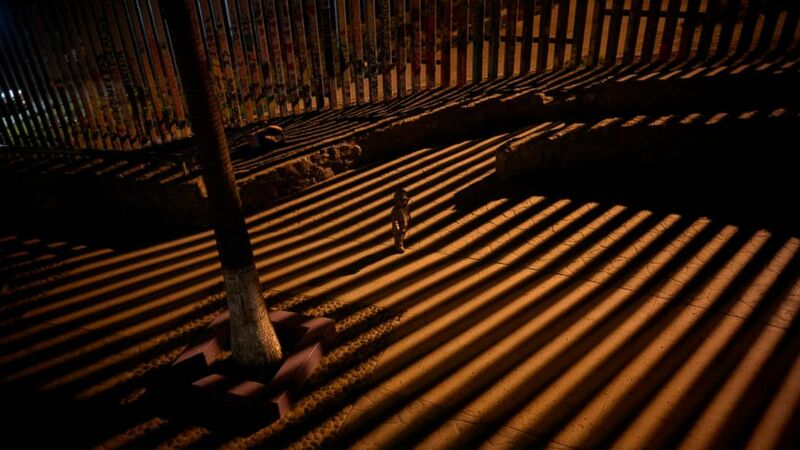 (AP) In this Jan. 11, 2019 photo, a boy plays as floodlights from the United States filter through the border wall in Tijuana, Mexico. In court filings, the administration has estimated a total of 2,737 children were separated from their families under "zero tolerance." But a report released Thursday by internal government investigators found that there were likely "thousands" more kids separated from families in 2017, before that policy took effect. The Health and Human Services inspector general said that the number of kids separated from their families under the current administration is "unknown." While enforcement deterrents like the ones described in the memo have been effective in stopping adult men from entering further into the U.S. for economic reasons, experts at the nonpartisan Migration Policy Institute say those methods don't address the current humanitarian crisis. "There is no evidence that such deterrence tactics work against the humanitarian flows today," MPI analyst Sarah Pierce told ABC News. "So not only is it immoral, but it is misguided and foolish."